René Descartes was born in La Haye (now called La Haye-Descartes), into a well-to-do family. His mother died soon after his birth. Joachim, his father, was a judge in the High Court of Brittany; he soon remarried, and Descartes was brought up by his maternal grandmother. At the age of ten he was sent to the Jesuit College at La Flèche in Anjou, where his masters allowed him to stay late in bed because of his poor health. Descartes later described La Flèche as one of the best schools in Europe. 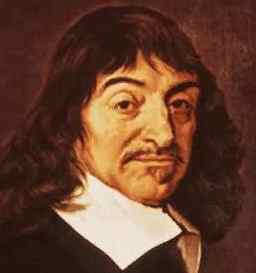 Descartes studied classical literature, history, rhetoric, and natural philosophy. In 1616 he obtained a degree in law from the University of Poitiers. At the age of twenty-two, he enrolled in the Protestant Dutch army of Maurice of Nassau. He spent several years as a soldier and met the Dutchman Isaac Beeckman, who awakened his interest in mathematics. For Beeckman he dedicated one of his earlier works, Compendium Musicae, which was written in 1618. In 1619 he served in the Bavarian army. While on duty at Ulm, he devised a methodology for the unification of the sciences. According to a story, Descartes had spent a cold morning in a "stove-heated room" (or, according to some sources, in a large oven or poêle), and when he came out, half of his philosophy had got ready. From 1619 to 1627 Descartes lived in Paris. He spent the rest of his life traveling outside France, settling eventually in Holland, where he remained from 1629 to 1649, his great creative years. There he devoted himself to philosophy and sciences, resolve "no longer to seek any other science than the knowledge of myself, or of the great book of the world." Although he was Catholic, Descartes opposed scholasticism. To put an end to the current philosophical ideas that went so far as to deny one's own existence, he started to inquire human knowledge on the basis of methodological skepticism, "Cartesian doubt." He introduced the famous of device of a malignant demon, "who has employed all his energies in deceiving me." But however great the demon's deception and how much the senses sometimes deceive, "he can never cause me to be nothing so long as I think I am something." Descartes argued that one can doubt all, but not one's own existence as a thinking being, "for example that I am here seated by the fire wearing a dressing gown." Existence, being a perfection, can no more be separated from the concept of a supremely perfect being. From this he concluded that God must exist, and because God cannot be a deceiver, the significance on sensory data must be evaluated by reason. Descartes' friend Antoine Arnaud criticized his reasoning: "We can be sure that God exists, only because we clearly and evidently perceive that he does; therefore, prior to being certain that God exists, we need to be certain that whatever we clearly and evidently perceive is true." Although one can doubt that there was any circularity (the "Cartesian circle") in Descartes' original arguments, he had to maintain that there are some basic logical truths, which are present in us from birth, such as something cannot both be and not to be at the same time. By 1634 Descartes had completed his Le Monde (The World), but withdrew it after hearing what the Inquisition thought of Galileo. Discourses on the First Philosophy was published in 1641, together with a series of Objections by noted thinkers. Descartes also was the founder of analytical geometry. In his thirties he wrote a treatise on dioptrics (the science of the refraction of light) which was a substantial contribution to the science of optics, and he composed one of the first scientific treatises on meteorology. In 1637 Descartes decided to publish his dioptrics, his geometry, and his meteorology; and he prefaced these works with a brief Discourse on the Method of rightly conducting one's reason and reaching the truth in the sciences. The three scientific studies are now part of the history of science. According to some estimations, the preface is reprinted every year and has been translated into more than hundred languages. Discourse on Method was written in French, not in the more conventional Latin, and was addressed to the general reader. The autobiographical work is divided into six parts. Descartes portrays himself as a sort of Socrates in search of truth and wisdom. The first two parts depict his early philosophical doubts, and culminate in the discovery of his "method". He finds four rules for reforming his own ways of thinking: first, accept nothing that is not clear and distinct; second, divide difficult subjects into many small parts; third, start with the simplest problems; fourth, be comprehensive. In the third part Descartes explains his system of morality, metaphysics in part four, and in part five he describes his model of cosmos and the mechanics of human body, especially the workings of the circulation system. Part six provides an introduction to the essays on meteorology and optics. Although Discourse was an economical disappointment for Descartes in sales figures, it attracted a wide and immediate reaction. Descartes' publications brought him fame throughout Europe. He entered into correspondence with most of the learned men of his time. In 1644 he published, in Latin, The Principles of Philosophy, which he hoped to gain similar position as standard texts based on Aristotle. The last of his full-length works, The Passions of the Soul, grew out of his correspondence with Princess Elizabeth of Bohemia, the niece of Charles I of England, but was dedicated to Queen Christina of Sweden. In it he argued that the mind is not directly affected by any part of the body, except the pineal gland in the brain. All sensations consist of motions in the body that travel through the nerves to this gland and there give a signal to the mind, which calls up a certain experience. Mind and body are distinct substances, which made immortality possible. In 1649 Descartes went to Sweden, where he was invited by the Queen Christina (1626-89) to teach her philosophy at five o'clock in the morning and to establish an institute for sciences. Descartes became ill with pneumonia and died in Stockholm on February 11, 1650. The illness was contracted through his being forced to break his usual habit of late rising. Four years later Christina abdicated her throne and converted to Catholicism. She died in Rome. I think - therefore I am.